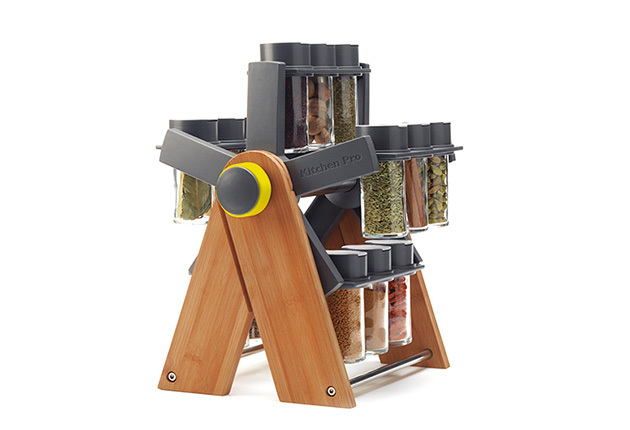 The Ferris Wheel Spice Rack Is Like A Rolodex For Flavour | OhGizmo! By David Ponce on 10/08/12 • Leave a comment! Cookin up some tasty chili but can’t find that cumin? Simmering a mean pasta sauce but the darn oregano got waylaid? That’s fine, we get it, it’s complicated to keep track of all those spices. We usually got’em stashed in the plastic containers we bought them in, used once and tossed in a drawer afterwards. But if we took the time to organize things a little, we’d definitely get the above Ferris Deluxe Spice Rack. It holds 15 different spices in a convenient Rolodex-like spinning wheel and makes it super easy to get to what you’re looking for. Even better, it comes pre-filled! You can choose either “Spice Market” or “India Spice Market” for a different variety of flavours. There’s no info on price or availability, although those in the UK will get free shipping when it does go on sale. For info on the specific spices included, hit the link at the bottom.